To adapt the testimonies of human trafficking survivors into comics, using drawn portraits of the beneficiaries to conceal their identities while preserving the impact of their stories. Ideally the content will cover their background, where they came from, how they met their dalal, where they were trafficked to, the nature of the work they were forced to do, how they found their way out of the situation, and what they currently do now. Success stories are critical and often left out of anti-trafficking messaging. Beneficiaries’ names have been changed to preserve their anonymity and they will be given the chance to read their stories in draft form to ensure they are comfortable with the approach taken. Their approval is paramount. To get as broad an understanding of the issue as possible I have varied the ages of the interviewees, from teenagers through to adults in their sixties, and from as wide a range of districts as possible. Current districts already visited include: Lalitpur, Kavre, Banke, Dang, Bardia, Kanchanpur. Districts to visit in late Jan’/Feb include: Sindupalchok, Makwanpur, Bara, Dhading, Siraha, Sarlahi, Jhapa. 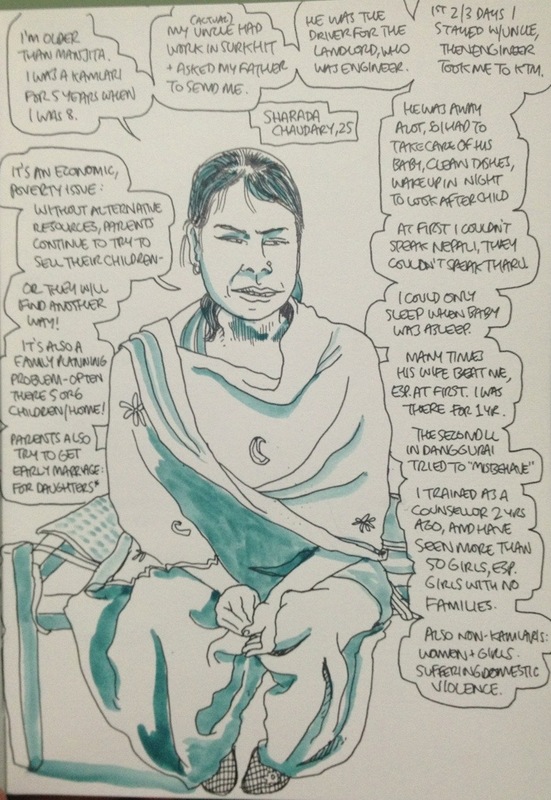 With permission in certain cases I have sketched and recorded audio of the English translation of survivors’ testimonies in Nepali to help me later with my notes when writing up the finished comics. Ex-Kamlari girl from Bardia district interviewed in partnership with Nepal Youth Foundation, January 2013. To take printed versions of the comics, translated into Nepali or the local language, back to the districts (not the same villages that the beneficiaries came from – new sites that are unfamiliar with anti-trafficking messaging) and, in partnership with NGO field offices (Current partners include: World Education, Child Development Society, Change Nepal, Nepal Youth Foundation, Shakti Samuha, PLAN Nepal), use the comics as part of a survey in conjunction with Stanford and Vanderbilt universities to measure the impact of different forms of media (radio, brochure (text and photos), comics, theatre) as awareness-raising tools. We continue to add NGO partners to our roster and are actively seeking new parties interested in sharing their networks and resources. Redo the survey in the same villages as phase 2 to assess the impact of different media, as well as the related incidence of it altering behaviour as a result. Excerpts of the interviews I have conducted have been published by assorted news outlets in the US and UK, thus far including The Poynter Institute and BBC online/World Service. For a 3 min introduction to the project and the graphic novel I’m writing to chronicle the process, watch my Kickstarter video below. I’m delighted to say that I raised $13,303 to successfully fund the project in December 2012.